It’s been a LONG time since we’ve posted anything to Traveling Tuttles. For those that only follow the blog and not our Instagram, it might seem that we’ve fallen off the face of the earth. Happily, that’s not true! Wanna know what we’ve been up to since May of 2017? Get ready for a whirlwind rundown to catch you up to speed! May 2017 : Moved back to the Vail Valley in Colorado to raft/work with our old rafting company, Timberline Tours while we figured out our next step. Christian guiding Dowd Chute on the Eagle River. August 2017 : Christian applied to be a patroller at a mountain resort in Idaho named Tamarack Resort. A beautiful sunrise view from the summit of Tamarack during one of Christian’s patrol shifts. April 2018 : After falling in love with the area, we decided we wanted to settle here. So, we bought an undeveloped acre lot in Donnelly, ID (6 miles from Tamarack Resort) to build our future home on. This was us on the lot on purchase day - you can see Tamarack Resort’s ski runs behind us above my head. May 2018 : Moved back to the Vail Valley again to work for Timberline Tours for one more summer. August 2018 : Trekked back to Donnelly to get the lot in shape and attempt to build a house before winter hit. We parked Little Foot on the lot, ordered a porta potty and got a membership at the lodge gym so we’d have a shower to use nearby. Biggest first steps to developing the lot were getting a shipping container to store our supplies and tools, had a well dug and electricity run to the lot. Yes, we mowed that entire acre with a old wobbly push mower. We set up camp in the back, which made for a lovely private homestead. September 2018 : Finished prepping the lot and finalizing the building plans. Received our building permit on Sept 19th and had our foundation being laid out by the end of the day. Every day from that point on was a building marathon. Aerial view of the lot to give you a good idea of the layout - it’s pie shaped. October 2018 : Built. Every day. Literally woke up, got to work and didn’t stop until it was dark. 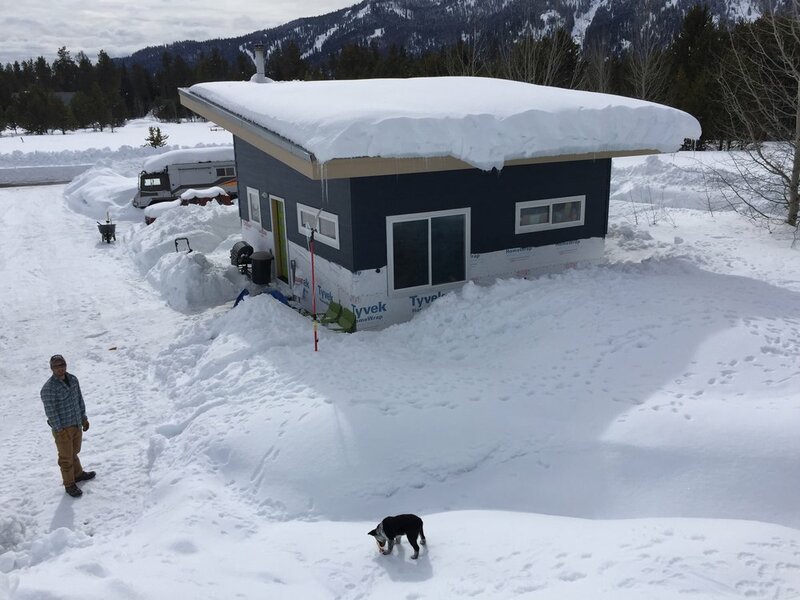 Our friend Colin (fellow patroller at Tamarack and now neighbor) is a contractor and would come over regularly to teach us how to do the next step of our build. Here we are enjoying the beams he helped us lay for our floor. A rainy chilly shot of the third wall shortly before we lifted it into place. Some of the walls required help, others we were able to muscle ourselves by building and lifting them in pieces. November 2018 : Built. Every day. Like it was our job and we would be homeless if we didn’t finish by winter. The interior, with insulation shortly before we had a team come put in drywall (we were going to do it ourselves, but were warned against how labor intensive it would be and how much time it would take with just the two of us. We’re so happy we hired someone else to do it for us. The exterior, close to putting on siding and a roof. December 2019 : On December 6th, we received verbal confirmation from the building department that it would be ok for us to move into our house…an unofficial sort of “occupancy permit” if you will. January 2019 : Adopted a puppy (who, with some serious training and effort will become an avalanche rescue dog! ), got our official occupancy permit for the house. Gracie tucked away in Christian’s patrol vest on her first day at work! Gracie and Loulou joined in for a family photo when we received our official paper copy of our Certificate of Occupancy! February 2019 : Got 14 feet of snow. We had a few massive storm cycles in February, which kept us shoveling to keep up with access to our house and driveway. Luckily, our partially finished house fared well! Though I might have missed some details along the way, I think this covers the last few years in a nutshell. I’m excited to get back to blogging again and start updating on a regular basis. I’m getting back into photography full time and having a blog to put my photos into is a great excuse to make sure I have my camera on me at all times to document our lives. Stay tuned for more frequent updates from now on!